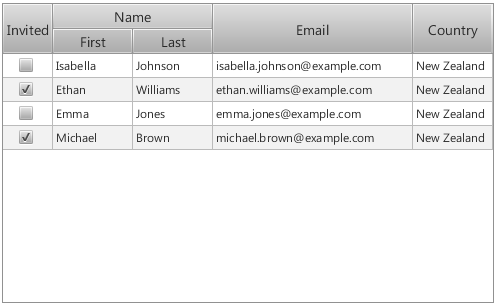 A TableView control using default styling and API as provided in JavaFX 2.0. The end result is precisely what you see in the second image above (there ain’t no photoshop trickery here!) 🙂 Hopefully this helps people customising their user interfaces, and hopefully also encourages you to further explore what is possible. The best starting point is the excellent JavaFX documentation website, the CSS Reference (which is about to be updated for 2.0.2 I believe), and as always, the caspian.css file that ships with every JavaFX release (embedded within jfxrt.jar). Thank you for advice, saved me a lot of time! Please could you tell me how to attach this css . i have made one as u posted but its not working. Thank you for this. 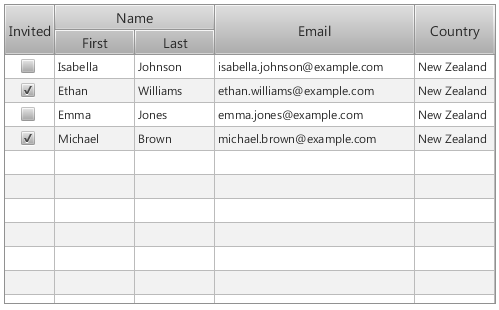 Any idea on how to add a style to specific rows? how i can get tablerow into drawTable.getSelectionModel().selectedIndexProperty().addListener(…);?